Enjoy this fresh tiny desk concert with Saba. Every Tiny Desk is special, but sometimes the stars align and we’re treated to an artist just as he’s coming into his own. Six months after releasing Care For Me — a sophomore studio LP on which Saba transforms his survivor’s guilt into something equal parts traumatic and transcendent — the Chicago native paid a visit to Tiny Desk. His performance at NPR’s Washington, D.C. headquarters came just two days after he announced his first tour of Australia, New Zealand, Japan and Korea, scheduled to begin in November. It’s an incredible achievement for an independent artist who released one of 2018’s best hip-hop albums without the benefit, or creative constraints, that come with major-label backing. To help translate Care For Me live, Saba brought along a band consisting of the same musicians who helped bring his album to life in the studio — including Daoud Anthony and daedaePivot, who produced the entire LP with him; instrumentalists Cheflee and Brandon Farmer; theMIND and Kaina, who contributed vocals on the record; and another featured vocalist and special guest that Saba took extra pride in introducing. „You’re not gonna believe me when I say it,“ he prepped the crowd, turning to the tall man wearing the Saba tee and Panama hat. „This is Chandlar, my father.“ Fans of the album may be familiar with Saba’s references to his dad on the songs „Life“ and „Prom / King“ — the epic seven-and-a-half minute eulogy to Saba’s cousin and Pivot Gang rap collective founding member, John Walt, whose 2017 murder serves as the impetus for Care For Me. But Chandlar is also an accomplished soul singer, songwriter and producer in his own right, as well as one of Saba’s earliest musical influences. 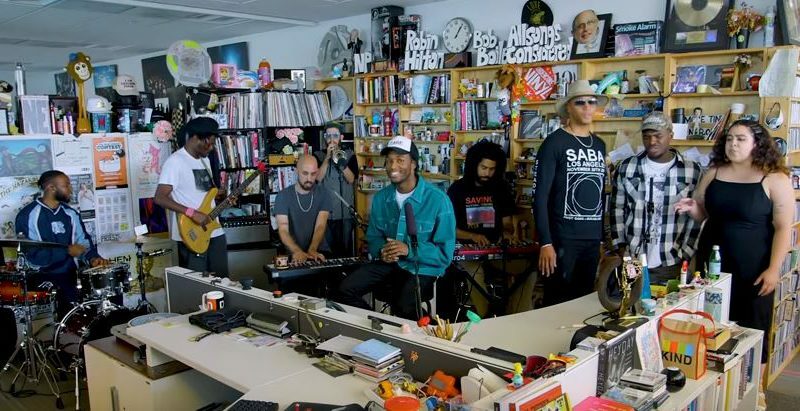 In a live set that proved to be as resonant as Care, Saba and his band showcased the album’s emotional depth and range with stark juxtaposition, like the sound of the bright hook on album closer, „Heaven All Around Me,“ set against a particularly haunting version of „Life.“ It’s a Tiny Desk testament from an artist whose future feels as promising as his pen.